Pacific Northwest Ballet Principal Dancer Noelani Pantastico in "RAkU"
I’ve spent the past few days thinking about “RAkU,” Yuri Possokhov’s 2011 work that had its Pacific Northwest Ballet premier on Friday, April 13th. “RAkU” is loosely based on the true story of the 1950 burning of Kyoto’s Golden Pavilion, but it really focuses on one woman, danced opening night by the always amazing Noelani Pantastico. “RAkU” combines video projections designed by Alexander V. Nichols with Shinji Eshima’s powerful score to high, stylized, dramatic effect. A live, off-stage chorus performs Gary Wang’s libretto, creating an eerie aural web that seems to tighten around the onstage action. The choreography is demanding; a meld of classical ballet inspired, according to program notes, by Japanese Butoh. The four warriors---Miles Pertl, Dylan Wald, Dammiel Cruz and Guillaume Basso, seem to move as one being. Seth Orza’s Samurai is strong and stoic; Kyle Davis’ monk is menacing and creepy. But this ballet is built around the woman, and as always, Pantastico invests her entire being in her character. 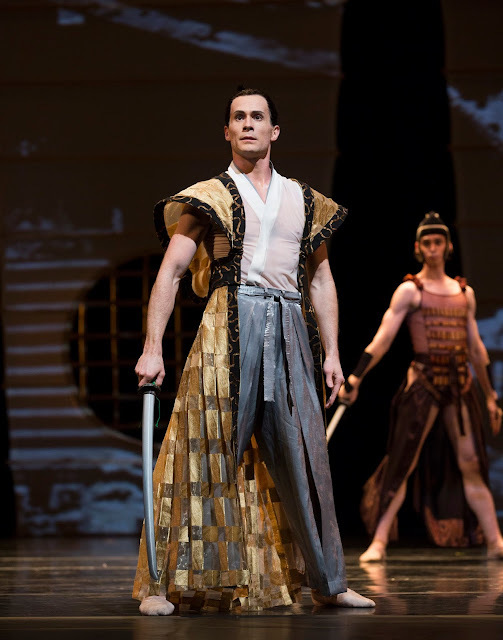 Possokhov has created a tragedy beyond a temple's destruction. This story chronicles a woman's demise. After her Samurai lover heads to battle, the woman is preyed on and ultimately assaulted by a temple monk. When the four warriors return the Samurai’s remains to her, she succumbs to a grief as fiery as the blaze the monk ignites. Pantastico is beautiful and demure when we first meet her; after removing her kimono, she transforms into a passionate woman in love with her Samurai. As the ballet unfolds, Pantastico journeys through wariness, terror, despair and grief; as one of PNB’s best dramatic dancers, she delivers each authentic emotion with lyric, fluid movement. Pantastico and Orza in "RAkU"
“RAkU’s” story is disturbing, but watching it in 2018, it is also unsettling. In the moment of the performance, I was transported by the ballet’s theatricality. Afterwards, questions arose. Was this story Possokhov’s to tell? An artist I know, a woman of Japanese descent, was part of the chorus, so I asked her about“RAkU;” was Possokhov's ballet another example of cultural appropriation. Her response was a delicate, and diplomatic, yes. When, if ever, can artists take stories from other cultures and create new work? Can non-indigenous artists use native idioms? Can, or should, male authors create authentic female protagonists? Can Caucasian choreographers create work based on non-Western themes? Is Possokhov's "RAkU"somehow less beautiful, less worthy of performance because he told the story? "RAkU" was sandwiched between two amazing works that I could watch a hundred times: Alejandro Cerrudo’s evocative “Little mortal jump,” featuring most of the stellar cast that premiered it at PNB two years ago. PNB Principal Dancer Elizabeth Murphy with corps de ballet member Dylan Wald in "Little mortal jump"
From Price Suddarth’s whimsical entrance, through Dylan Wald and Elizabeth Murphy’s poignant and beautiful pas de deux, “Little mortal jump” is dance full of promise and hope. Crystal Pite’s epic “Emergence” caps the program, and if you haven’t yet seen this ballet, do yourself a favor and get tickets for one of this weekend’s four performances. It’s a ballet about group think, and in this case, the group includes dozens of dancers. But it’s also a ballet that features smaller moments: Rachel Foster “hatching;” Price Suddarth unfolding his wings and charging the phalanx of black-clad women; Lindsi Dec and Karel Cruz moving together as if their two bodies are one. I could go on and on. PNB company members in Crystal Pite's "Emergence"
PNB will take both “Emergence” and “Little mortal jump” to Paris in early July. Artistic Director Peter Boal considers them signature company works, and in this iteration, they look fabulous. So does “RAkU.” But I wonder whether it will become a signature work, or a beautiful ballet whose time in the PNB repertoire is as fleeting and ephemeral as an onstage video projection.